Screener™ is a multi-channel, file-based production screening device that records universally playable MP4 files. Specifically aimed at directors, producers and other industry professionals working in studio, mobile, sporting and a variety of other environments, Screener replaces legacy DVD recorders that have been traditionally used for screening and offers a wealth of additional features that are useful for modern production. Screener™ has some extraordinary benefits. Its ability to create files from live-camera, and watermark graphics or text, and it can do an internal timecode overlay or burn-in. Screener is a very simple new solution that makes the review process extremely straight-forward. 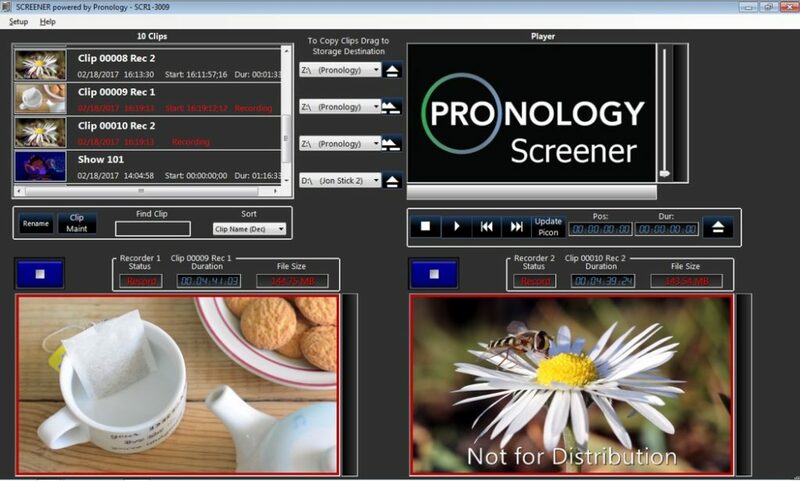 While Screener™ is based on the same basic architecture as mRes™, Pronology’s advanced encoder that can record three tiers of video per input channel and provide various file formats, Screener is a scaled-down version specifically designed to accommodate MP4 files for low-res viewing/screening applications.